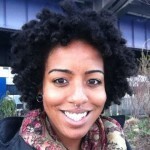 Teenage parents live at the nexus of several reproductive justice (RJ) issues. Many pregnant and parenting teens are forced out of school, pushed into low-achieving schools, low-paying jobs, and lack access to affordable housing. What’s more, teen parents are often ridiculed, shamed and stigmatized by their community, including by those who consider themselves RJ advocates. Teenage parents are not different from other people and want the same thing most of us do: a healthy, affordable, meaningful, and prosperous life for themselves and their families. Unfortunately, what teen parents often get is anything but that. Mass media and public service announcements have become the de facto source of information and representation of teenage parenthood. Public service announcements like those from The Candies Foundation, and most recently the controversial and hurtful New York City Human Resources Administration ads, present teenage pregnancy as the most terrible outcome a teen can experience through strongly worded and stigmatizing narratives. Instead of highlighting and providing medically accurate sexual health information these ads instead choose to present teenage families in a negative light. These one-sided and narrow representations of teenage families powerfully influence and shape the general population’s view of teenage pregnancy and teen parenting. 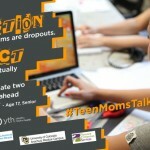 In addition to the public shame and discontent that is presented in public service announcements, TV shows, like MTV’s, “16 & Pregnant,” and “Teen Mom” , and pop culture spaces like magazine covers present teenage pregnancy and parenting as negative and sensationalized tabloid fodder instead of as real families. Teenage parents live with harmful policies; policies that offer reduced daycare vouchers for quality and affordable childcare options are being defunded and reduced for all families. The political and systemic reduction of already limited affordable housing effects teenagers, and because some teenage parents are under the age of 18, they are sometimes unable to access other social welfare programs. 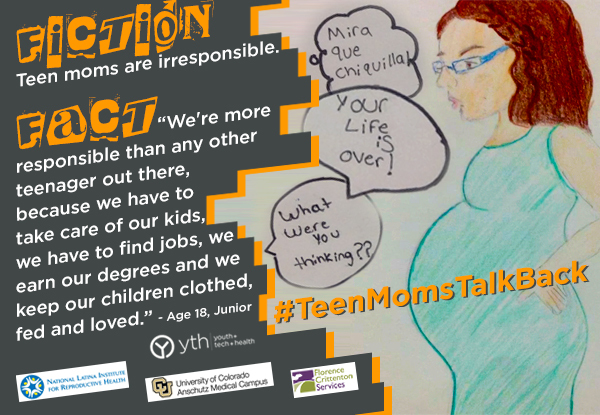 Teen parents are often used as political scapegoats, shamed and blamed for the very same systemic oppression and problems that increase their risk of becoming pregnant. This attitude has been, and continues to be, highly accepted inside and outside of many social justice circles and organizations. The reasons for this vary from group to group. 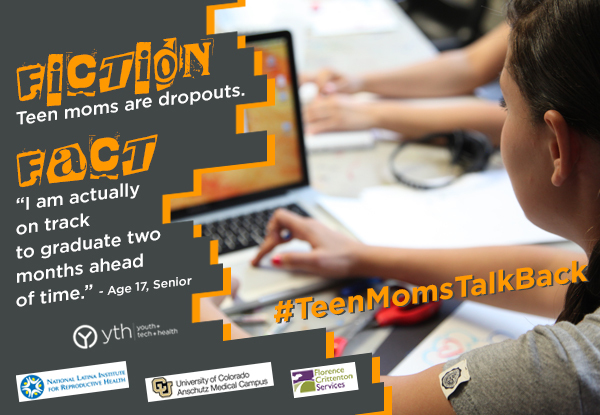 Much of the money that funds campaigns to prevent teenage pregnancy flows from funders who believe that presenting teenage parenting as only bad is the best way to combat teenage pregnancy. Messages directed at teen parents that encourage abstinence to discourage them from “making another mistake” (i.e. getting pregnant again and or having another child), are harmful. What’s more, they are limiting, disrespectful, and clear examples of what reproductive justice is not. When people only speak about stopping teenage parents from having another child, they are ignoring other conversations that are equally important: about teens planning their families and health. Teenage parents are human, and they have the power and autonomy to make decisions about their own reproductive lives and health – if and when they want to have more children, choose abortion, and or make an adoption plan. Teenage mothers need support and to be listened to regardless of the personal decisions they make in regards to their reproduction. In addition, teenage mothers who might be experiencing reproductive coercion and abuse need to have safe spaces to discuss their situations free of shame, stigma, and further coercion. In my opinion, reproductive justice is about the overall physical, mental, spiritual, political, social, and economic well-being of women and girls having the ability to assure that the lives they desire can be obtained. Any organization or person who does not include teenage families in their social justice work or fails to approach a teenage parent as a whole human, with an complex life, fails when it comes to practicing reproductive justice. If they are not including and/or speaking to teenage families in their work but state that they are a reproductive justice entity, they do not understand what reproductive justice really means. In circumstances like these, I believe organizations should stop using the phrase until they consult with teenage parents who are living this reality–and consulting with celebrities with exceptional circumstances doesn’t count. 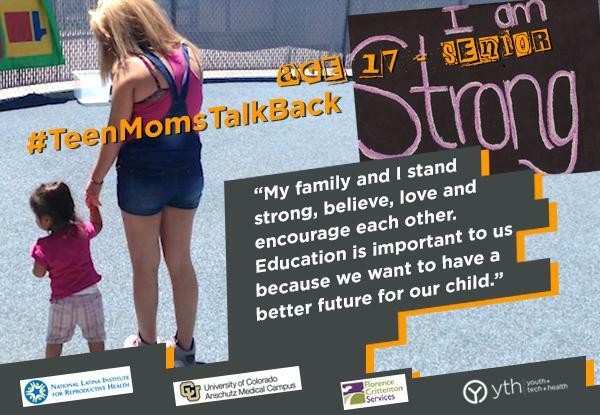 #TeenMomsTalkBack is a great place for everyone to start to learn and listen to (non-famous) pregnant and parenting teenage mothers, who share their stories of beauty, hope, struggles, and expectations. Through listening, learning, and challenging the ways in which we think about teenage pregnancy, we will be closer to understanding what reproductive justice really is. #TeenMomsTalkBack gives the mic to young women to share their stories; the least we can do is listen and respect them. See the video for yourself . 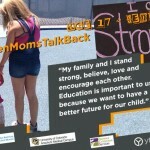 tags: reproductive justice, sexual health, stigma, teen parenting, teen pregnancy, teenmomstalkback.